But it’s been a long time since anyone who could call himself a wizard walked the world, and now that world is changing. Children in the city are falling ill, and something sinister lurks in the forest. Oscar has long been content to stay in his small room in the cellar, comforted in the knowledge that the magic that flows from the trees will keep his island safe. Now, even magic may not be enough to save it. I think the thing I loved most about this book was how the real magic of this story wasn’t the magic at all. Now yes, The Real Boy is indeed a fairy tale, with wizards, enchantments and all sorts of magical mayhem, but at the end of the day the true magic of this story lies in the simple power of friendship, and how it can profoundly touch (and alter) our lives. And so it’s not a magical charm or legendary wizard that saves this kingdom – no indeed this story does a brilliant job of portraying just why, exactly, magic is NOT always the answer to all our problems – but instead the rescue all boils down to one friendship, a friendship that is profoundly important to one lonely boy, and becomes the catalyst that eventually leads to him saving everyone. And that makes for a lovely, lovely story. And so our story begins with Oscar very much alone in his own little world, an island in a sea of people. But then suddenly one day Oscar’s ordered world comes apart – Caleb, his master, journeys off, leaving his apprentice Wolf in charge; only Wolf himself then disappears a day later, which leaves Oscar entirely on his own. And so for the first time in his life Oscar is forced to deal with the people around him, something he’s never attempted before – and watching Oscar as he painfully is confronted, again and again, by the burning self-awareness that he IS different than the rest, that he IS weird and strange and unnaturally bad at the things that come so easily to everyone else, that he is, in some fundamental sense, just wrong, was heart-breaking. Ursu does a brilliant job in taking us inside Oscar’s head to experience first-hand what goes on in a mind that today we’d place on the Autism spectrum, showing us what Oscar sees, feeling what he feels, and it was just beautiful and painful and sad and joyful, all at the same time. But then, then Oscar makes his first friend in Callie, the healer’s apprentice, and as she starts to help him navigate this much larger world he finds himself in, suddenly Oscar is not only dealing with people of every sort, he’s tangled up in the community at large – and like an avalanche, those ties draw him along until he finds himself facing down not only the magical monster which suddenly has started to ravage the town, but also the mysterious illness that is afflicting the city’s children. And as Oscar and Callie attempt to unravel the cause of it all – for they find there is a common root to both problems – it’s only by working together that Oscar is able to discover his own ability to stop it. And so this is indeed a story of magic and adventure, but more than anything else this is the story of a boy who dares to venture out into the dangerous adult world, though it doesn’t understand him and probably never will. And I think at times we forget how much we define ourselves by how other people treat us, by how other people see and react to us, which is why I loved this story so very much for how it explored the profound change it made in Oscar’s life when one person, just one person, saw and valued him for exactly who he was. And it’s that one friendship, the simple power of a relationship, that ends up saving not only a boy from his loneliness, but an entire kingdom to boot. And that, that is simply a wonderful story. Yet, much as I enjoyed this story, I do think Breadcrumbs hit me a bit harder where I live, for some reason, though I’m not entirely sure why. And I also found that The Real Boy did feel, at times, a bit…lumpy, for lack of a better word, in how it delivered its necessary information. The reveals of historic import in particular felt a bit clunky at times, in how they kind of landed squarely and slowed down the story flow a bit, but all in all it didn’t hurt the story at large – for that story is a really good one. 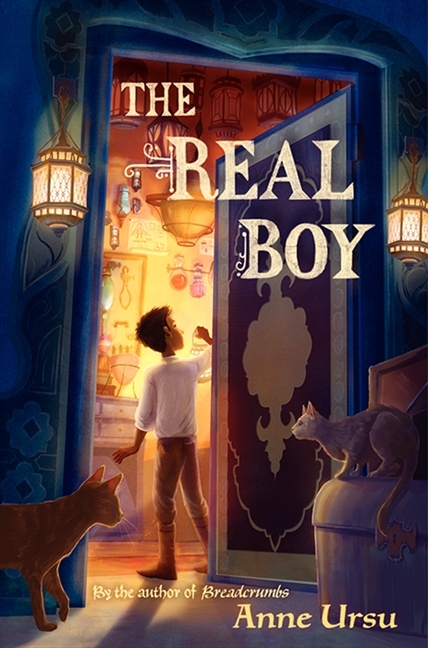 So in the end, The Real Boy is a wonderful book, a tale that is not so much about saving the kingdom – though Oscar does that too – as it is about one young boy figuring out who he is, what he’s made of, and where it is that he belongs. And that, that truly is a lovely, lovely story. Like Breadcrumbs, The Real Boy is a book that resonates very deeply (I still think that Breadcrumbs speaks more to me, personally, but I think they are both equally important and beautiful books). Anne Ursu writes simply poetically. Not with a ton of fancy words or lengthy descriptions, but by keeping things simple and somehow piecing things together in a way that is astounding and stunning. I have heard really good things about this one. Glad you liked it. I am definitely going to add it to the TBR pile.